When winter is upon us nothing warms you up like a delicious hot soup. We all want to get the right amount of fruit and vegetables every day but suddenly salads seem much less appetising than they did when the weather was warm. A vegetable based soup if the perfect way to get your vegetable intake and is a delicious warm supper on a cold winter evening and is the perfect comfort food after a hard day at work. What’s more, if you choose the right vegetables soups can be a fabulous gluten free dish. If you want the soup to be accompanied by some lovely crusty bread you can pop to your nearest specialist food store and find a huge range of tasty gluten free breads. Soups really are so simple to make. You can literally stick all the ingredients in a pan and voilà you’ve got yourself a delicious tea in no time. One thing they are often accused of though is being boring. Many people thing soups are starters only and are not really very exciting. But the thing is you can add whatever you want to your soup and make it as exciting and tasty as you like! 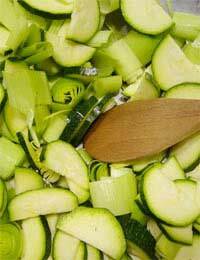 This courgette soup recipe is full of flavour and is delicious as a main course or as a starter. Served with crusty gluten free bread it’ll be a family favourite before you know it. To make this gorgeous soup you will need a 350 mls of water, 600 mls of milk, 3 chilies, 1 teaspoon of chopped garlic, 1 onion, 1 vegetable stock cube, 4 courgettes, bay leaves to serve and salt and pepper to season. Cook all the vegetables along with the garlic in a saucepan on a low heat with a little olive oil until they start to soften. This will probably take around ten minutes. Add the water to the vegetables and sprinkle in the stock cube. Stir continuously and boil up the mixture. Once boiling add the milk and then reduce the heat so the mixture can simmer. Season well with salt and pepper and leave the mixture to simmer for around 45 minutes. When ready serve piping hot and garnish with the bay leaves. This soup is also delicious as a broth. If you wouldn’t rather have it that way cut the vegetables chunky and once the soup is cooked pour it through a sieve. Serve the broth with crusty gluten free bread for a tasty supper snack. Soups needn’t be boring. All you need is a little imagination and creativity and you can create some delicious culinary masterpieces. It’s all about finding different flavours and tastes and working out which flavours go best with each other. Go on, experiment! Just make sure you always check that the ingredients are gluten free.